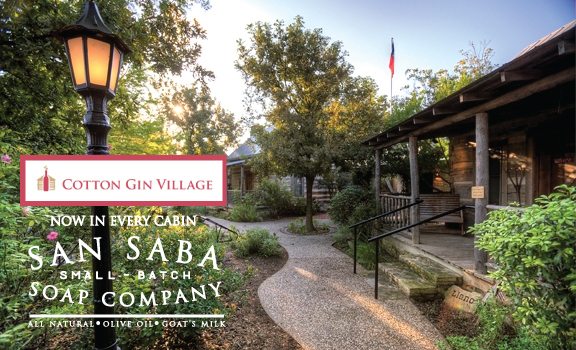 Fredericksburg's Famous Cotton Gin Village Now Offers Local San Saba Soap Company In Every Cabin - San Saba Soap Co. The sounds, smells and sights inside Cotton Gin Village all contribute to the authenticity of this cabin-circled retreat in Fredericksburg, who for most, are there to shop and Texas wine taste until they drop. Chef Ross Burtwell, owner of Cabernet Grill – Texas Wine Country Restaurant and Cotton Gin Lodging knows exactly what his guests need after a long day: an incredible meal and an evening of deep relaxation; which is why every detail, including the bath soap, has been thought out. 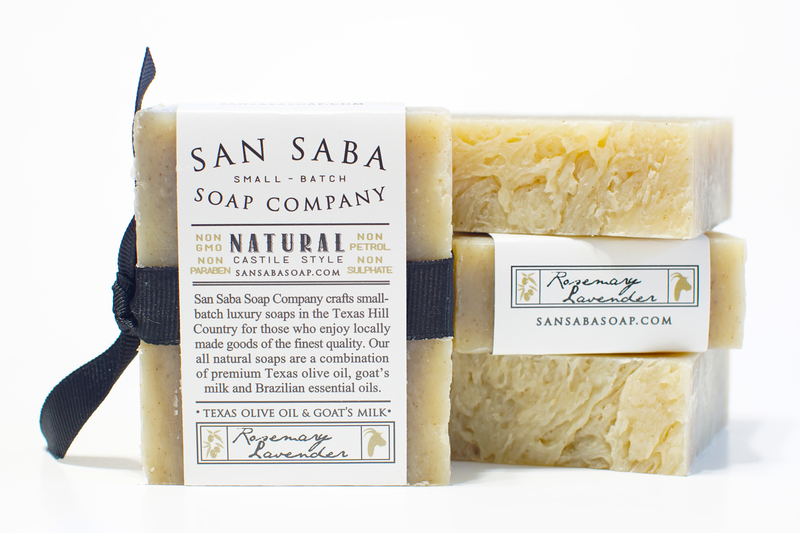 San Saba Soap Company is a high end, small-batch soap producer in the Texas Hill Country, and the newest guest amenity at Cotton Gin Lodging. Goat’s milk is rich in antioxidants and Vitamin A, and also minerals like selenium, all of which repair sun damaged skin. Olive oil, another base ingredient rich in antioxidants, is highly moisturizing without clogging fine pores. The ancient essential oil combination of Rosemary and Lavender has been used for centuries to improve memory, calm the nerves and create an overall heightened sense of wellbeing. Guests of Cotton Gin Lodging can unwind with the fragrant scent of Rosemary + Lavender, confident that what’s going on their skin is healthy for mind and body alike.